The World Bank Group’s Identification for Development (ID4D) initiative announced the launch of the Mission Billion Challenge to make the ‘invisible billion’ – the number of people who still cannot prove who they are –, visible. 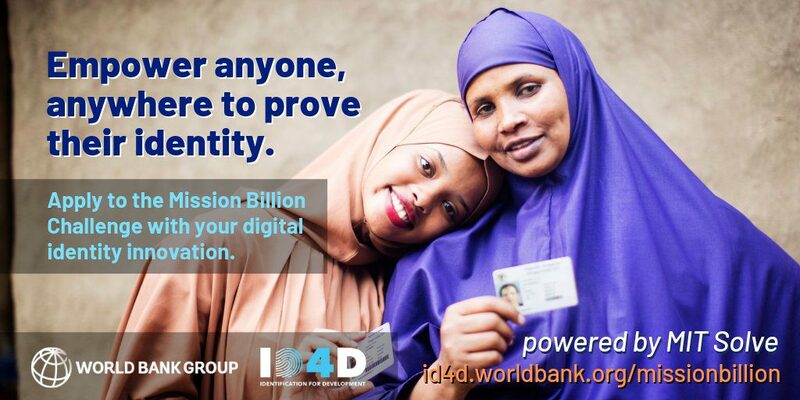 Mission Billion will crowdsource innovative solutions to strengthen data privacy in digital identification systems and empower users to have greater control of their personal data. The Challenge offers cash prizes totaling US$100,000 with the top prize of US$50,000 for the most promising solutions that enhance trust and protect personal data from being misused or compromised. The inaugural Mission Billion Challenge is powered by the MIT Solve platform, an initiative of the Massachusetts Institute of Technology, that uses open innovation and crowdsourcing to solve global challenges. creative solutions from academics, entrepreneurs, scientists, technologists, and engaged citizens. Finalists will be invited to a high-level event in Washington, D.C. to present their solutions or ideas in front of distinguished judges. A total of US$100,000 in cash prizes available with a top prize of US$50,000. In the event of a tie, winner will be selected based on the criteria described in Judging Criteria (1), then (2), and finally (3). If there is still a tie then the winner will be selected based on a vote by the Judging Committee. Through this MIT Solve platform, innovators and organizations, can submit a solution to the Mission Billion Challenge. Submissions will be evaluated by committees formed of staff members of the World Bank and partner organizations. The final evaluation panel will be composed of globally recognized experts in the field of digital identification systems. World Bank retains the right to not select any winners or award any prizes if it so decides. Previous articleTRi Facts Election Fact-Checking and Verification Training Workshop 2019 for mid-career journalists in Nigeria.